You found me! I have the freebie today! I am so excited, too. I don't generally like bugs at all, however there are a couple that I can watch flit and float about because they are so beautiful and graceful. Butterflies and Dragonflies are so pretty with their style, grace and colors. Have you ever noticed how fluorescent a dragonfly's wing are? So delicate just like fairy wings. When Lindsay asked me if I had anything in particular in mind that I'd like to have as "my" freebie my first thought was of a dragonfly. Lindsay not only made me one, but three! I only get to give one away, but don't forget that Lindsay has a perpetual sale. For every $5 that you spend, you get a free digi-stamp. My sister Karin introduced me to the glitter puzzle technique about 2 years ago. Very cool technique. So when I saw this image that Lindsay made at my request, I knew that either I was coloring so boldly to create a stained glass effect or I was doing glitter. Glitter won. I'm not a bold colorist. So I set about "coloring" this image with Stickles. I printed the image on card stock (in retrospect, I should've picked heavier weight card stock) and then flipped the image and printed onto a transparency. It doesn't line up perfectly, but it came close and added dimension. When the Stickles was thoroughly dry I added the loose glitter that I do have which is Martha Stewart coarse diamond glitter to the surrounding area of the dragonfly. Click on the picture to see if you get an enlarged version to see the detail. Now, I should've either used thicker cardstock to withstand the moisture of the Stickles better, or used loose glitter because it warped a bit. I did try pressing it under some heavy books and it helped a bit, but it did not flatten. But I still like the effect - again, added dimension. This is a side view of the card, here you can see how the transparency looks lying above the cardstock. You can also see a close-up of this cool silver, metallic ribbon I got on one of my ribbon buying trips. 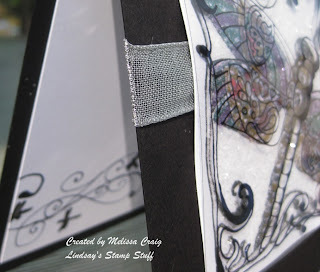 You can also see a little peek of the dragonfly border that Lindsay created. Love the image? Get it free HERE. Enjoy!! Thanks for stopping by and don't forget to visit Lindsay and the rest of the Design Team to see what they created to share with you today. They are all linked up in my sidebar. Oh wow, Melissa!! This is just beautiful. Mel~amazing card!! 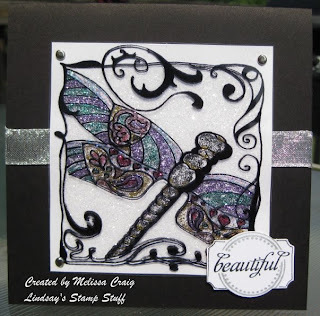 Love that image and how your fabulous glitter application. I have never tried that technique and I surely will! it is stunning! I'm so glad you picked a dragonfly! So pretty! I love that transparency too! The detailing on the inside is perfect! I just love this stamp. I haven't used it yet though. Beautiful card! I love the way you did it, thanks for explaining it! wow such a gorgeous card!! Breathtaking, Melissa! The technique is just perfect for this image. Oh Melissa this is just BEAUTIFUL!! I love that technique and will definetly give it a try! You explain things so great! Thanks for all the tips!! Beautiful - love the look of all the glitter! Awesome card Melissa. Giggle giggle - love the Joni comment! this is absolutely GORGEOUS> I have been reading and re-reading how you did this and I must figure it out! It is just plain STUNNING! yeah! Thanks! I found the free digi! I think your card is FABULOUS! Don't think of it as warping, think of it as added dimension. You nailed this one, girl! So super gorgeous! I love this technique and the dragonfly was perfect for it.